Writing in a vacuum is a wonderful thing. It's something that only first-time novelists really have the pleasure of doing, because with each subsequent novel you write—assuming that all goes to plan in the publishing of your novels—anticipation grows. There's an audience there, and the books that you're throwing at them have to somehow meet the expectation that said audience feels. The easiest path to pleasing them is in the quality of the text presented. If each book is, on some fundamental level, "better" than the last, then the audience will nod and smile and appreciate what you've done. Of course, it's not that simple, especially when you're a novelist like David Mitchell. He's been consistently published as a writer of no easily referenceable peers, writing structurally challenging books that manage to play with concepts that—were he not published as a literary writer—slide firmly into the scope of various genre fictions. Ghostwritten , his 1999 debut, is fairly uncategorizable. It's a series of stories, interlinked by characters and themes, and it takes in ghost stories (perhaps obviously), SF, historical fiction, and more standard literary fiction. (Incidentally, a short word about this concept of the literary text. The industry seems to use this to describe not only books that are well-written examples of writerly craft, but also those that speak of standard situations—people and ostensibly real, relatable lives. I'm not buying that. That's dramatic fiction, and we should call it such.) It's a great debut novel, and more than almost any writer I can think of, marked out his path of intent with regards to his future writing: this is how I mean to continue. So, his subsequent novels have danced in every single genre it’s possible to write within, in some way or other. Number9dream (2001) is a crime-romance; Black Swan Green (2006) a childhood-eulogising drama; The Thousand Autumns of Jacob de Zoet (2010) a historical romance. Cloud Atlas (2004) (which perhaps is his most remembered and referenced novel) is another mish-mash, like his debut, with genre hopping all playing into the overarching themes of continuity and reincarnation. Nothing about David Mitchell suggests that he is a standard "literary" novelist. That's how he defined himself from book one, regardless of how the publishing industry has tried to shape perception of him. Reviewing in a vacuum is wonderful as well. This, I've been unable to do. 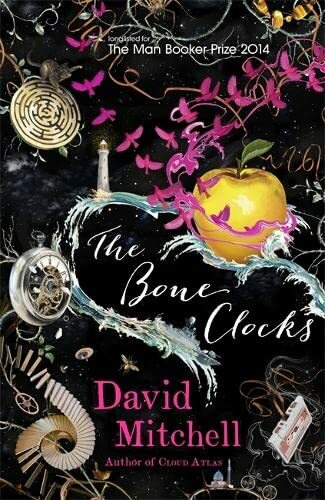 The Bone Clocks has been reviewed now by almost every major news publication in the world, as well as hitting the Booker longest (in what's arguably, given the introduction of the new Booker rules, one of the hardest times to do such a thing). I can't ignore that stuff. This review, by necessity, is as much a review of the attitudes towards The Bone Clocks as it is the book itself. To lay out my own thoughts before I begin: this is a spectacular novel. Again returning to the fractured, fragmented structure of Ghostwritten and Cloud Atlas , it moves between stories over a period of time. Each story follows one specific character, Holly Sykes. We meet her as a 16-year-old in 1984, and the first section of the book details her life at that age: tormented by an idiot boyfriend, obsessed with music, lost and confused. It’s hugely evocative, and anybody who loved Black Swan Green should be right at home here. And then enter the genre elements, the Horologists and the Anchorites; and, eventually, the titular Bone Clocks. It's these elements that seem to have caused some reviewers to become confused, lost in their ability to distinguish between authorial intent and their own expectations. This is not what we expect , they seem to be saying, so it's a failure. Black Swan Green didn’t feature SFF elements. Number9dream wasn't a genre novel, not really. Neither was Jacob de Zoet . They were all human, passionate, sweet and terrifying and powerful and clearly driven by some degree of autobiographical thought. 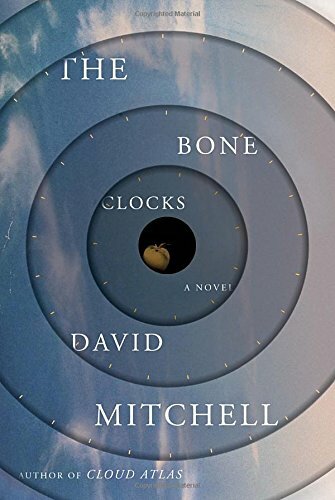 The Bone Clocks is all these things, but with a stronger element of SFF fiction than anything Mitchell has written thus far (and I include the far-future apocalyptic scenarios of Cloud Atlas in that statement). I'm not going to detail these elements here, because their presence and development is one of the joys of this book. Their introduction is fascinating, playing with conventional genre tropes in a way that shows both a love for genre and a true understanding of what can be done when one steps outside of the realism mode for just a brief few moments. Many of the already-published reviews say that these elements somehow change the text for the worst. I have seen the SFF elements described as "silly," the fact that there's a 16-year-old narrator in the first section meaning that it "reads like a novel for young adults" (with all the passive-aggressive negativity inferred in that phrase definitely intended). There's a suggestion that perhaps Mitchell would have been better sticking with what he knows: writing literary novels. But it's abundantly clear, as you read through The Bone Clocks , that this is what he knows. The genre elements never intrude, never feel as though they're not part of the same story. In fact, they do more than they could: they drag every novel he's published into the same world, changing the existing texts, shining new light upon them. A character from Jacob De Zoet reappears here, defying time and space and notions of humanity, that changes the presence of them throughout Mitchell's oeuvre, without tainting those original texts. His back catalog is a slightly metafictional, multi-textual fantasy epic, just like we used to get—only, perhaps, we didn’t realize what it was until now. The Bone Clocks doesn't stop changing. It moves through Holly's life, giving up regularly paced intervals in which we see her grow and change, all in never less than believable ways. The genre elements of the novel are there constantly, influencing her life, but only in such a way as perhaps the chaos of a more real life itself might. She never becomes a super-hero; she has a child, marries, grows up, suffers loss, heartache, pain, joy. Everything you would want and expect from a life. Then there's this spine through the novel, unobtrusive, watching her. The characters who fully embody the SFF elements of the novel are almost passive observers, for the most part. Holly's story is the crux, and they're watching. They are, it becomes abundantly clear, a proxy for Mitchell's readers, traveling different worlds and stories, desperately trying to seek common threads, looking for similarities, eschewing change and forcing constancy. It's quite a tremendous idea: to not only knot his books together in this way, but to drag the notion of untying those knots along with it. There's one major moment in the book where that idea—and the weight that such an idea carries—becomes overbearing. In the second-to-last section, there's rather too much exposition, and perhaps were this written for a more perceptibly forgiving audience (one that, say, has immersed itself in genre its entire life) that might have been avoided. As it stands, it's a little too force-fed. I prefer my fiction to be somehow more vague, leave more questions than it answers. That feels somehow healthier, especially in a world such as Mitchell has created—it relies on the intelligence that you grant your reader from the get-go, and exposition such as this can have a tendency to feel like hand-holding for an audience that's maybe more used to the concepts and ideas presented here. However—and here's the rub, the issue that some reviewers seem to almost subconsciously have with the book—Mitchell isn't sold as a writer for a genre audience. He's published as a literary writer. This is a serious novel. In all of the comment pieces about the Booker longlist, a couple of novels have been slightly sneered at, as if their content might not jibe with what the award usually promotes. Mitchell's is not one of them. It's assumed that it will stand with what's expected of him: playing with genre, maybe, but certainly not immersed. When readers of those expectations get the book, therefore, calamity occurs. This isn't a book that dips its toes into genre waters; it's immersed in them. What is The Bone Clocks ? It's possibly the year's best fantasy novel. It's probably not going to win the Booker prize, for that very same reason. It's a sprawling tale of one person's life, and all of the ups and downs that go along with it. It's beautifully written. It's hugely affecting (with the final section in the novel carrying a message that's terrifying even without the concept of knowing what it means for the future, thanks to Cloud Atlas ). It's probably David Mitchell's best book. For some audiences, it's his most accessible; for others, his least. And it's a novel that we should celebrate. Because we moan about the genre ghetto; we moan that SFF is trapped, not taken seriously by the mainstream. We see that happening in reviews of books like this, a novel that could actually hit readers that would never ordinarily pick up something ostensibly about (mild spoilers) time traveling immortals, and we should rally against that. This book deserves to be a success. It's serious fantasy, written brilliantly, and we—a community that loves genre and all of the possibilities that it holds—should shout about that as loudly as we can. James Smythe is the award-winning author of The Explorer , The Machine , and No Harm Can Come to a Good Man , among others. He's on Twitter @jpsmythe.